Indian Coconut Rice Recipe made with grated coconuts, cashews, and cooked rice. The recipe is so simple and straightforward which takes less than 5 minutes to make effortlessly. A best satisfying food for busy days or weeknight dinners. A very popular lunch box recipe in South India which is, dairy free, vegan and vegetarian recipe. Unlike other Indian recipes which require the long list of ingredients and long processing time, this is one of the easy recipes which made quickly every time. Indian coconut rice recipe is the best meal for busy days or busy weeknight dinners. 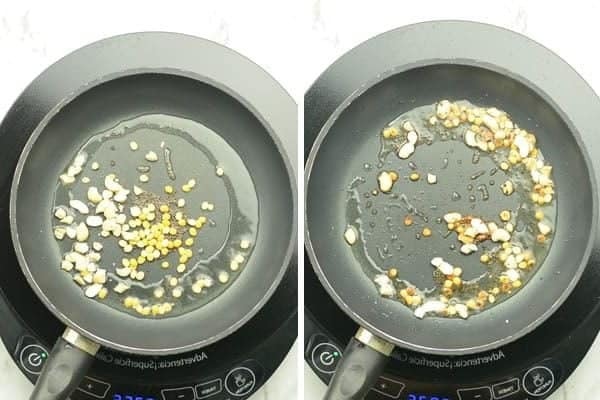 Generally, a single dish will be made in different ways. And every family will have their own a recipe, remarkably every family has their secret tips and ingredients to bring out the dish to their personal fondness. But that is not happening regarding Indian coconut rice recipe. It does not differ much and tastes similar throughout Tamil Nadu and Andhra Pradesh. Also known as Thengai Sadam in Tamil and Kobbari Annam in Telugu. Have you ever tried tasting this recipe in the United States? Probably not. This rice is an everyday home cooking menu and is rarely served in the Indian restaurants here. However, I have seen a very handful of restaurants serve this frequently in the buffet counter. 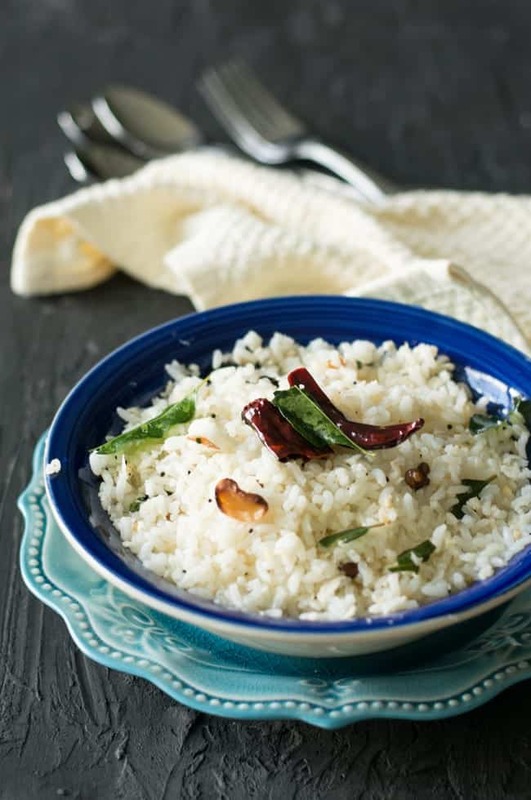 This is a classic South Indian coconut rice recipe made with grated coconut, curry leaves, and red chilies. Usually made with long grain white rice and this is one of the dishes I have grown with. Today is Wednesday, I’m not sure how the middle of the week to you. But for me, it is tiresome and hectic, where I need to scratch a lot in deciding today’s menu. Accordingly, I’m looking out for a simple, easy, healthy recipe for the lunch. I believe that lunchtime is the most important. It must be a healthy meal and should give satisfaction which can carry you for the rest of the day. In general, you should not feel the craving for the remaining part of the day. 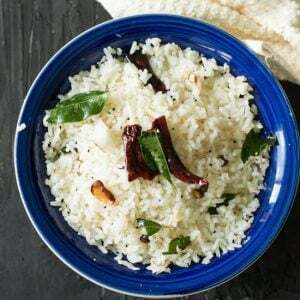 Now you know the reason for why I chose coconut rice for today’s lunch menu, the tasty Indian coconut rice recipe without coconut milk. If you are searching for more rice recipes, you may also check Chitranna rice, Coriander rice or Bagara rice. Yes, of course. Coconut has many medicinal benefits. It is an excellent source of fiber and good cholesterol. It is great for skin and immunity. Where coconut is commonly used in every South Indian home especially in the states Kerala and Tamil Nadu. The right quantity is always good for health. Healthy and unhealthy food all relay on have we make and how we eat. A small disclaimer, I am not a dietitian or nutritionist, and I’m just sharing what I know. I did not know about the history or any literature references for this Indian coconut rice recipe. But it is the very traditional dish in Tamil cuisine passing on for several generations. Furthermore, this is one of the recipes which is a custom to serve on baby shower day. Indian coconut rice recipe is usually made with fresh coconut. Break open the coconut and grating them is not the easy task as you think. It is the toughest, and you cannot imagine of doing this on the busy hours. Not surprisingly, this is very messy and time-consuming. I wanted to cut down the cooking time the preparation time effortlessly. Henceforth I substituted the traditional method with the modern foodstuffs. Frozen coconut or the desiccated coconut is really fun to work within Indian coconut rice recipe. These are stress-free and taste perfect when comparing the fresh coconut. Additionally here in the United States, we are not getting right coconut which is good for cooking. Means I have to rely on frozen grated coconut from the nearby Indian stores. At times I make coconut rice with the desiccated coconut or dry coconut flakes. My guest from India to cannot find the taste difference between the fresh and readymade grated coconut when they tasted thengai sadam aka coconut rice. What goes with Indian coconut rice recipe? I guess this would be the first question pop-ups in your mind after reading this long. Coconut rice The coconut has a mild and rich aroma. It is great to pair with simple and spicy dry curry. Potato fry, Arbi fry, cauliflower 65 are some of the dishes that taste delicious along with this. Indian Cuisine is all about boosting up the flavors of the food. 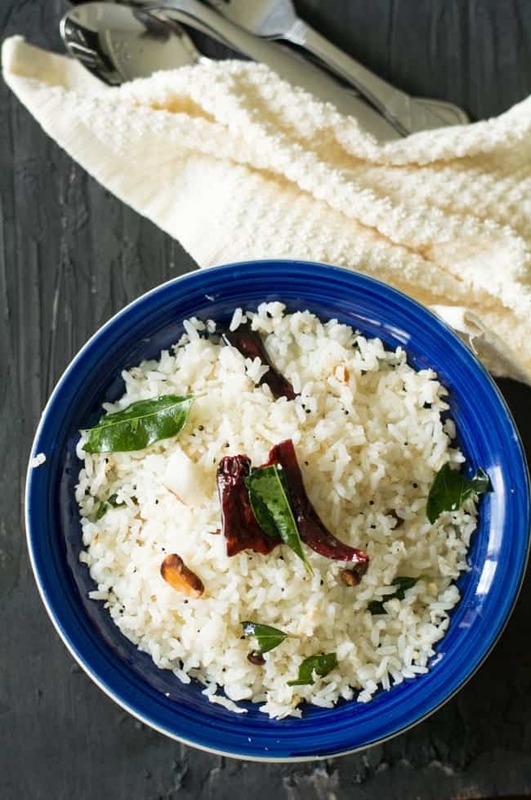 Curry leaves, red chilies, and asafetida are the flavor boosters of coconut rice. The combination of these three does the magic and brings the bold, satisfying flavor. Curry leaves is another unique ingredient, which will be available in the Indian stores. Or you may also get dried version online. I strongly recommend using curry leaves in this Indian coconut rice recipe. The flavors of curry leaves and the red chilies give intense taste to the rice. I have added Bengal gram. This gives you additional protein to the meal and adds crunchiness to the recipe. Cashews have a richness and make every bite more enjoyable. If you are thinking of variation, you may add chopped almonds, pistachios also. 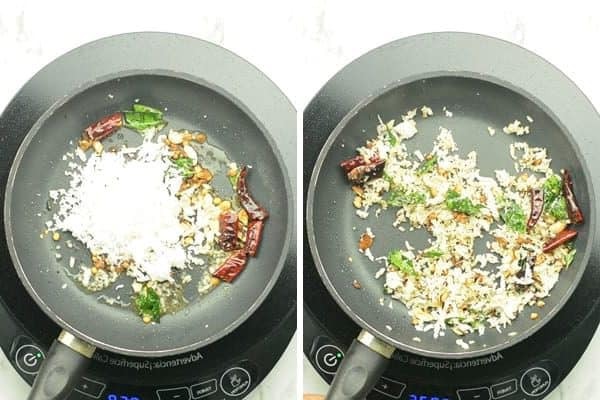 To make Indian coconut rice recipe, firstly, In a pan add cooking oil, mustard seeds, Bengal gram, and cashew nuts. Allow mustard seeds to crackle. Add curry leaves, red chilies, and asafoetida. Adjust the red chilies according to your preference. If you concerned about the spiciness, then add the red chilies as a whole. Which indeed gives the flavor but not the heat. Then add grated coconut. You may substitute grated coconut with desiccated coconut or coconut flakes. Then grated coconut gets cooked fast, so the medium flame is always recommended as it gets burnt quickly. Saute for few seconds until the coconut leaves out its moisture. If you are worried about this part, always keep the fire low and watch the developments. Then add cooked rice, and salt. Gently combine them well and make sure the rice is evenly coated with the coconut mixture. Serve hot. Coconut rice tastes super delicious after 3-4 hours of making. As the rice will be infused with all the flavors. Indian Coconut Rice Recipe made with grated coconuts, cashews, and cooked rice. The recipe is so simple and straightforward which takes less than 5 minutes to make effortlessly. A best satisfying food for busy days or weeknight dinners. A very popular lunch box recipe in South India which is gluten free, dairy free, vegan and vegetarian recipe. 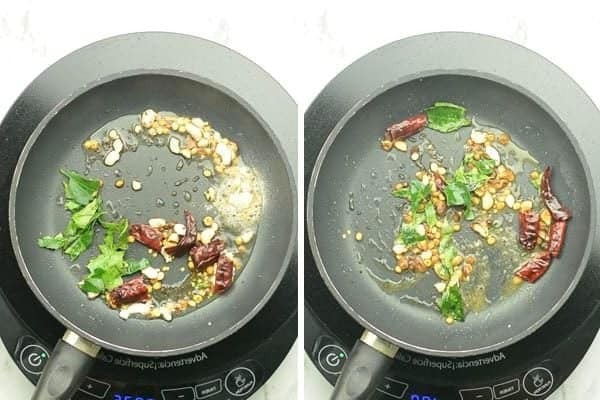 In a pan add cooking oil, mustard seeds, Bengal gram, and cashew nuts. Fry them until mustards splutters. Now add curry leaves, red chilies, and asafoetida. Fry until the red chili's color changes. Add grated coconut and fry until it leaves out its moisture. Switch off the flame. Now add cooked rice and salt. Gently combine them and serve. Store the leftover in the refrigerator. And it stays good for 4-5 days in the refrigerator.